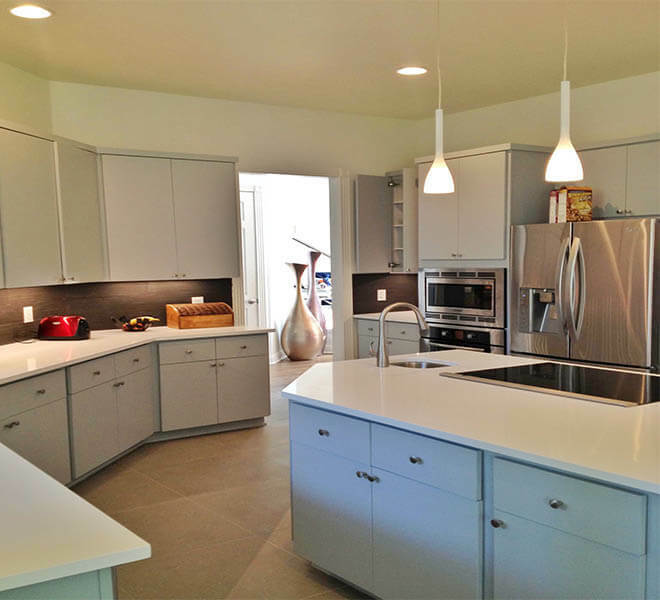 Quartz Stone is a composite made-up of 93% Quartz, 7% Polyester resin and pigment. Quartz is a non-porous stone that does not need to be sealed like granite or other natural stones, in order to keep them from staining. It’s practically indestructible and pretty much maintenance free. The non-porous and non-absorbing nature of Quartz stone surface makes it very hygienic; it does not harbor bacteria, which makes it a safe choice for food preparation on the counter surfaces. 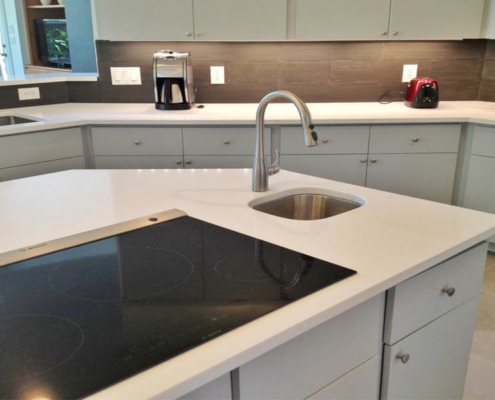 WHY SHOULD I CHOOSE QUARTZ FOR MY COUNTERTOPS? 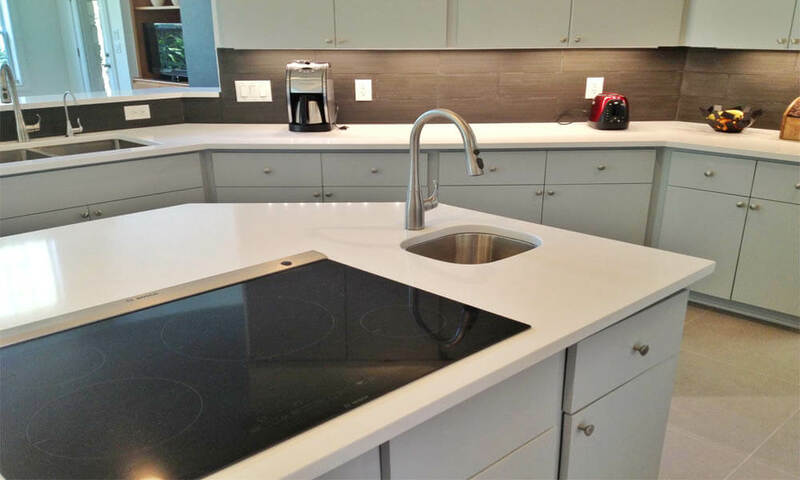 Quartz is becoming more and more desirable due to the color selection, less movement and less maintenance. 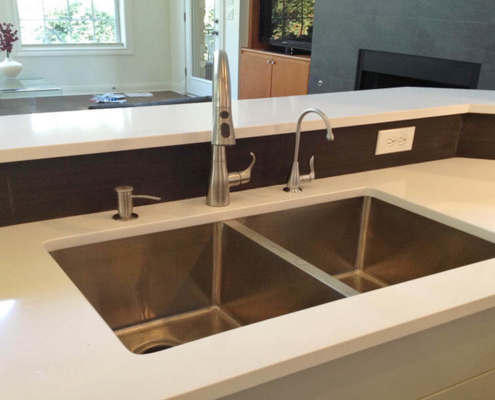 Quartz is a very hard material and will last the lifetime of your home. Due to the absence of the movement in most Quartz the seams are easier to hide and in some cases can become invisible. If you wish it makes a beautiful backsplash. HOW DO I CARE FOR MY NEW QUARTZ COUNTERS? Cleaning your Quartz stone kitchen counter tops is quite easy. It involves using a little soapy water or a mild cleaner. Quartz is comprised of Oxygen and Silica. The main component of Quartz is Silica or Silicon Dioxide. Quartzite is formed due to the metamorphism of Quartz and Sandstones and is found in more areas than Quartzite. 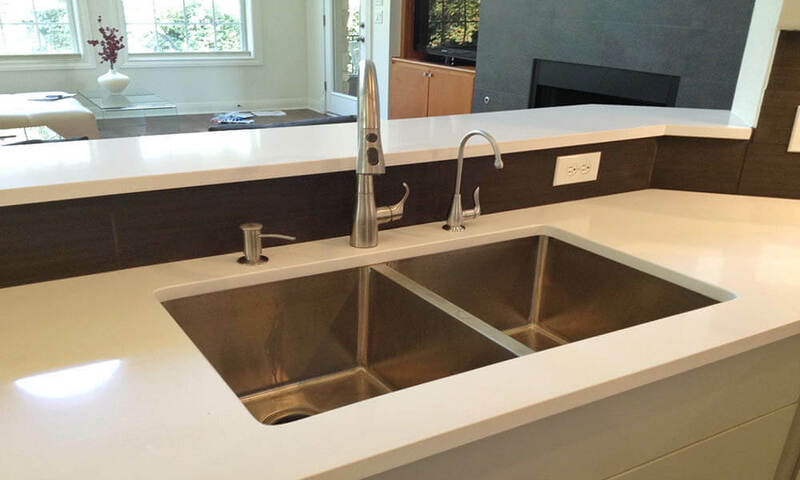 Though Quartz and Quartzite are both hard, Quartz is a much easier natural stone to work with. WHAT IS THE DIFFERENCE BETWEEN QUARTZ AND GRANITE? Since Quartz is very popular with its color and has the absence of movement it is a great look for someone who is wanting a simple clean-cut kitchen. This allows you to have a minimalist style with almost no visible seams. One of the down sides of Quartz is its lack of resistances to temperature. Unlike Granite, if you place hot pots and pans on your counter it will stain with Quartz. Granite counters are heat resistant and can withstand the heat of hot pots and pans without damage to a certain temperature. Granite is also a natural stone that is hard enough to resist most abrasion, weathering, strong enough to bear significant weight, and it accepts a brilliant polish.